We are pleased to have Karlene Karst, RD, a mother, author, nutritionist and developer of the SeaLicious™ and VegLicious™ line of omega oils speak to our stance on supplements. She is aligned with our approach in her explanation of why many people are deficient in good fats and why our diet may not be a good enough source—thus calling for a need to supplement. Offering a holistic perspective that takes into consideration individual uniqueness, she also dishes on the best types of omega oil supplementation to make your job of choosing one a lot easier and more informed. Build Your Cells from Fat: Healthful Fat, That is! We have come full circle with the nutrient fat, from full-fat to low-fat, and now to focusing again on healthful, full-fat foods in our diet as a way to ensure optimal health, energy, and a balanced body. We know that a lack of certain fats in the diet can be detrimental to our health. As a mom, I give my boys organic whole milk; we also eat and cook our food with butter, coconut oil and other cold-pressed oils, and we eat full-fat Greek yogurt and avocados daily. Luckily my boys have been drinking fish oil from the bottle since they were six months old. Yes, thankfully, it seems that fat has come full-circle. In a perfect nutritional world, you will receive all your good fats from your food. Unfortunately most people are not consuming enough of these healthful fats in their diet or are eating hydrogenated oils and processed foods that diminish the positive effects of the good dietary fats. This results in a chronic deficiency of long-chain omega-3s, namely eicosapentaenoic acid (EPA) and docosahexaenoic acid (DHA). Healthy omega-3s are the foundation for good health, therefore, in order to overcome dietary deficiency we need to focus on supplementing with a high-quality fish oil. Next to Aspirin, fish oil is the most studied “drug” in the world, with an impressive body of research confirming the health prevention and treatment benefits for numerous chronic diseases including brain and emotional health, cardiovascular disease, as well as many other inflammatory conditions. Our body is built out of cells, cells are built from membranes and membranes are built from fats. It isn’t even an option, but a must to build your cell membranes from healthy fats. Therefore, my foundational nutrient of choice is fish oil containing omega-3s, EPA and DHA. Supplementing with a liquid fish oil is the most efficient way to deliver appropriate amounts of omega-3s. Just 1 teaspoon per day provides 1,500 mg of omega-3 per serving, which would be the equivalent of 5 x 1000 mg softgels, therefore compliance improves (its easier to take a teaspoon of oil), as does the health benefit. Liquid oils are also better absorbed by the gastrointestinal tract, therefore improving bioavailability and delivery. 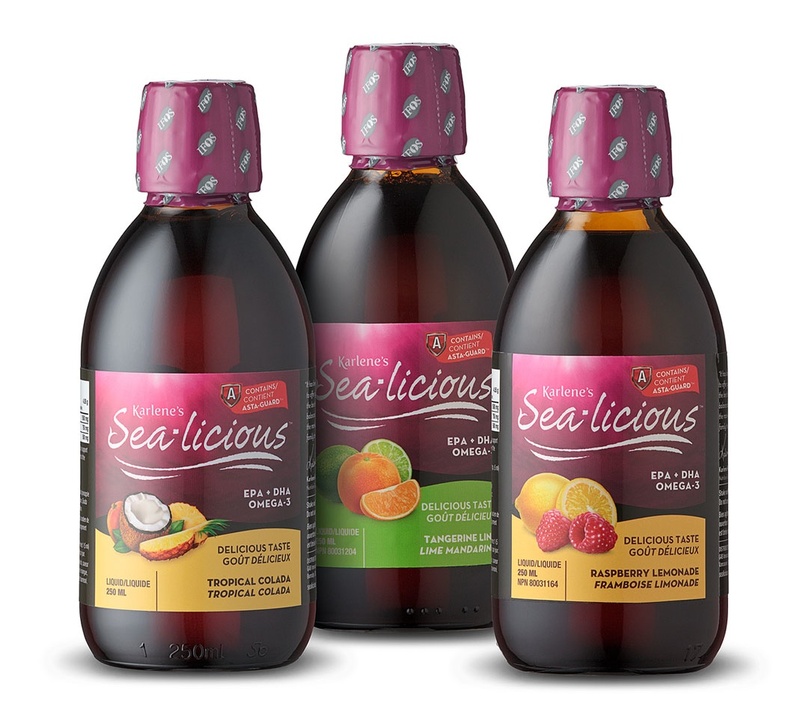 SeaLicious™ is the most delicious omega-3 fish oil available. Luckily, techniques to flavor and purify the oil have come a long way from the days of rancid-tasting cod-liver oil that our mothers used to give us. It tastes so delicious you won’t believe it’s fish oil. For vegetarians, vegans and those wanting to increase their omega-s from plant sources; VegLicious™ offers a complete blend of delicious cold-pressed oils extracted from camelina (omega-3), borage (omega-6), chia (omega-3, 6 and 9), pomegranate (omega-5), coconut oils and DHA (omega-3) from algae. These particular oils are the best sources of plant-based omega nutrition. Plant oils are considered to be excellent for soothing the digestive system, improving the alkalinity of the body (meanwhile decreasing inflammation) and for beautiful skin, hair and nails. I recommend 1 teaspoon of VegLicious™ per day that can either be taken by the spoon or mixed in with smoothies and salad dressings. Both SeaLicious™ and VegLicious™ offer a delicious way to increase the healthy omega fats in your diet, which are the pillars of health and considered to be foundational nutrients for supplementation. Love the flavor, and live the benefits with Karlene’s SeaLicious™ and VegLicious™. myWholeLife invites guests who are aligned with our philosophy on holistic nutrition to write content for our blog and other online channels. Register today to join myWholeLife’s mailing list, and be the first to learn about new products, the latest research, and app releases.